In India you see them grazing about the streets as if they're locals. At one time they were one of the most prized commodities and in many farming villages, still are. Cows and India carry with them one of those beautiful lifetime partnerships like Kajol and Shahrukh Khan. India without the cow is like an orphan child. It's just not right. Today we wanted to set the record straight on this age old myth. Our intention is to share the beauty of Indian culture, but also shed light on the truth behind a misinterpreted past. Cows are an important part of Indian culture. To many Indian farmers cows are invaluable because they plow the land, produce milk and byproducts like ghee, paneer, butter and cream. Also in some parts of India, cow dung is used to lay a strong foundation for homes and stoves. In these respects, cows are sacred. Killing a cow for meat was not an option because they provided so much value for families an communities. One cow had the power to feed an entire village. Also the more cows a farmer had the wealthier he/she was. 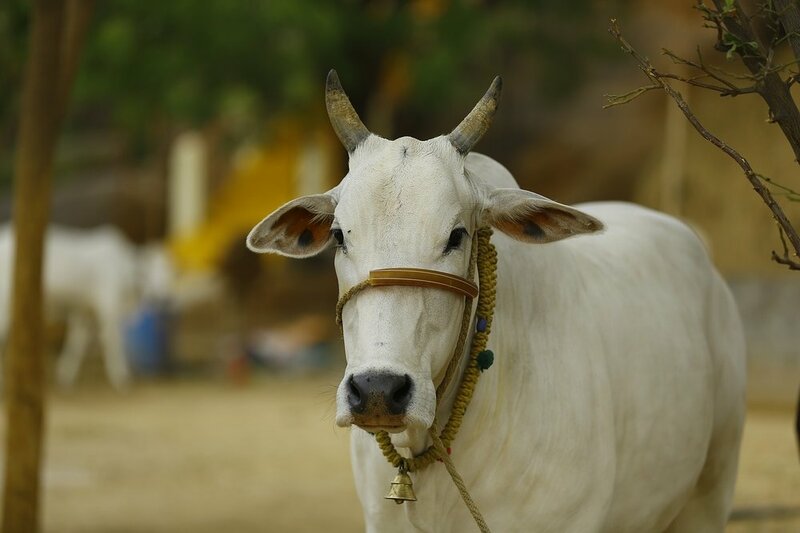 If you want to get into the details and scriptures regarding cows, please see this great article that the Huffington Post wrote called, "What the hindu scriptures really say about cow worship." In the article they go into detail about Hinduism and vegetarianism. It turns out that the religion never condoned the eating of meat. Through Vedic and Hindu philosophy one learns about non-violence and naturally gives up eating meat. The central theme around Hinduism and its off shoot religion Buddhism, is mitigating suffering for all beings. Even the word that is used to Identify Hindu's was initially geographical and not cultural or religious. The word Hindu is derived from the Indo-Aryan and Sanskrit word Sindhu which means large body of water. Indians lived across large tributaries of water and thus the name. Also Hinduism is unique in that it does not have a central founder. It's easy to see how misconceptions of a culture and it's people can be carried away. Through time people tell stories and although their is some truth from the past, the chance for fabrication is often times commonplace.